Waste Management Review speaks to business insurers RSM Group and the Victorian Waste Management Association about how the waste sector should respond to the difficult insurance market. At an April ministerial breakfast organised by the Victorian Waste Management Association (VWMA), business insurance company RSM Group’s Steve Richard highlighted the difficulties waste operators are facing to insure their sites. Steve outlined the cost structure of insurance companies and why it’s important now more than ever for the sector to reduce its risk profile to regain favour with insurance companies. Speaking with Waste Management Review, Steve says that never in his career has he seen any industry face as difficult a situation sourcing insurance as the waste industry is experiencing currently. He says the insurance industry is at the beginnings of a hard market which results in higher premiums, reduced capacity and much more stringent underwriting criteria. “As a result, brokers are broadening their scope with an increasing amount of placements overseas,” Steve says. Steve says that pressure in the insurance industry is mounting as reinsurers – those who set a maximum cap on the amount that can be paid out – are feeling the effects of large and frequent losses, which in turn pass pressure on to insurance companies. As reported by Waste Management Review in late 2017, the issue of waste fires intensified after a high profile fire in July last year, which burned for 11 days and forced hundreds of residents to evacuate. The fire prompted a state government taskforce, the Resource Recovery Facilities Audit Taskforce, to take action and it has been auditing recycling facilities across Victoria for the past year and consulting with industry. Mark Smith, VWMA Chief Executive says the waste industry is now being asked to lift its standards when it comes to risk mitigation measures, including stockpile regulations and investing in fire prevention technologies such as thermal imaging. “I think the waste industry does need to lift the bar. The problem is that it is being asked to lift the bar from a very low base to what government and regulators would like them to be,” Mark says. “The industry has had minimal support and no oversight for an extended period of time and all of a sudden there is now an intense focus on the sector. Mark says this has led to an overregulation of the sector, with the pendulum swinging into a heavy regulatory burden for all businesses. As a result, the waste industry needs to rebuild its repot with government before the regulations can be relaxed. He cites the development of last year’s interim waste management policy as an example of this. Last year, an interim waste management policy was declared following the significant July fire. According to Environment Protection Authority (EPA) Victoria’s combustible recyclable and waste materials page, the policy was declared as “a number of fires at resource recovery facilities have highlighted poor industry practices for storing and managing combustible recyclable and waste material”. The interim policy will remain in place for 12 months until July 2018 until a permanent solution is finalised. The policy gives the EPA additional powers to issue remedial notices to facilities deemed to not be properly managing their fire risks. It applies to operators of any site which receives combustible waste material and has seen the state government’s Resource Recovery Facilities Audit Taskforce take a risk-based approach to inspections and compliance and enforcement, targeting sites that pose the highest risk. 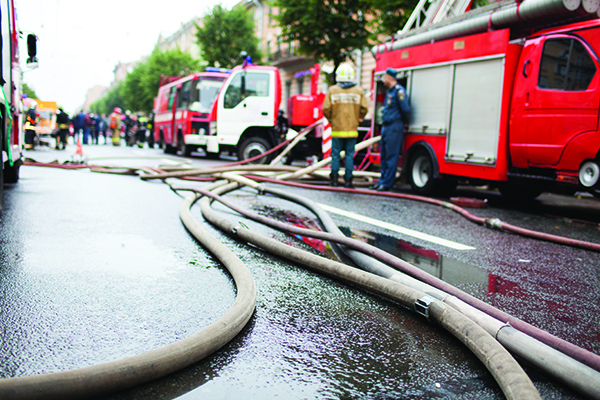 As a result, EPA Victoria released a new guideline titled Management and Storage of Combustible Recyclable and Waste Materials – Guideline, outlining the requirements for a fire risk assessment, controls to respond to the risk of fires, fire management plan requirements and storage requirements for combustible recyclable and waste materials. Mark says it’s of critical importance that waste sites maintain good favour with the public to ensure they can continue their business in communities unobstructed. Mark says he hopes this can stir up a conversation about improving site management processes. He says it would be great if as part of the taskforce, the government unlocked its sustainability fund, generated from landfill levies, to offer support to the industry in the form of low-interest loans or grants. In terms of choosing the right insurance program, Steve recommends using an insurance broker to ensure operators get the appropriate advice about risk management and discuss their biggest exposures. He says some operators have, in the past, been improperly insured when using direct insurers, as they are not geared to properly protect complex businesses. “For example, public liability protects you against third party property damage and personal injury. Most public liability policies for the waste industry have a pollution exclusion which exposes operators in the waste sector. For example, if harmful product is released into the environment necessitating an evacuation, there is a high chance this won’t be covered,” Steve says. Steve says the challenge going forward is opening up conversations with operators well before renewal to get all information required. He says it’s important to be proactive in showing insurers how important safety is to the management of your site. “We strongly encourage clients to get a professional property survey completed prior to presenting to an insurance company to show them the risk mitigation processes in place on site and open up the conversation,” Steve says. He says operators can improve their processes through better stockpile management and installing technologies such as thermal imaging to do so. Mark says the waste and recycling industry is going to have to go beyond government expectations in how it manages its risk into the future, which will need be supported by government finance to make the necessary infrastructure upgrades. Matthew Wright, General Manager – Technical Services and Deputy Chief Executive Officers of Fire Protection Association Australia, the national peak body for fire safety, says one of the challenges for fire protection of waste management facilities is that their level of risk varies hugely depending on what material they have on site, how it’s stored and how it’s processed. “There isn’t currently a single clear picture of what best practice management looks like regarding fire protection,” Matthew says. Matthew says that when developing a fire protection system for a waste management facility, operators need to consider numerous factors. This includes the size of the site, the buildings, systems and vehicles used there, the materials stored and how they’re processed, as well as how many people are onsite. The Victorian Government was contacted for comment, but didn’t respond by deadline.